whenever i pull these heels out of the closet, they put such a smile on my face. who doesn’t want to play dress up with glitter heels. i hope you enjoy them with this outfit. Gorgeous! I'm so in love with your dress and love the shoes! I love those sparkly shoes! really nice outfit sweety! 😉 you look so beautiful. YYEEESSSS to this entire outfit! Love it! Love this look! 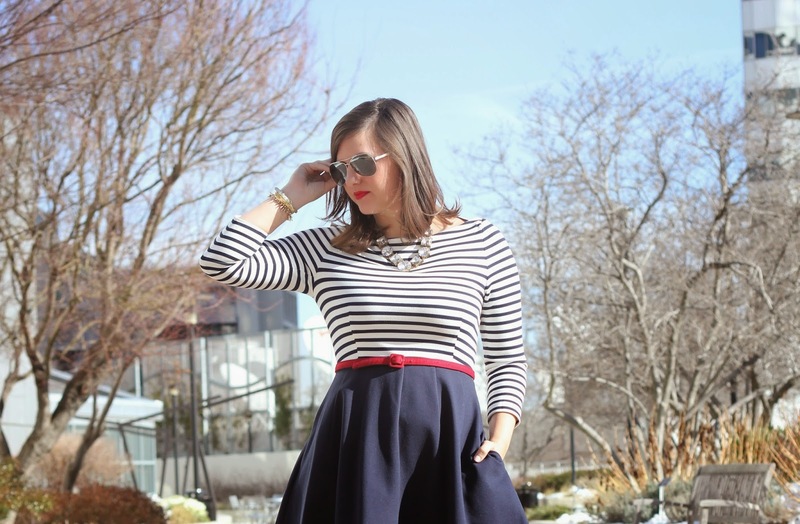 The striped dress is adorable! what a lovely look! I wish it was this warm here in Switzerland! Vanessa, I'll make a confession. It was freezing outside when I took these pictures. I then went back inside to wear this outfit. This look is so cute, flirty and fun! I love the silver pumps! Fantastic and amazing look, girl. Thse heels are TDF! Beautiful and chic and this necklace is fabulous! Great style! So classy and so fabulous! !